Youth Corper Executes N2.5M Projects in Offa Kwara State - Corpr! Corper Francis Chidozie Okoye, a 2012 Batch B corps member single-handedly constructed a Motorized BoreHole, Renovated NYSC Building, constructed a 20ft by 6ft Directional Bill Board and constructed an Executive Peacock Bird (Okin bird) at Owode Market Traffic Junction,which is seen as the symbol and Pride of Offa Kingdom, amongst so many others. Francis Okoye with State Code KW/12B/0069, from Anambra State. A 2012 Batch-B Corps Member, Presently Serving in OFFA Grammar School OFFA, Kwara State, but will be Passing out on the 6th of June 2013. He executed Eleven (11) Community Development Service Projects during my Service Year; which had direct impact on the community where he served. ra State University Uli; Posted to OFFA Grammar School, OFFA Kwara State for his Compulsory National Youth Service Corps (NYSC) Program. 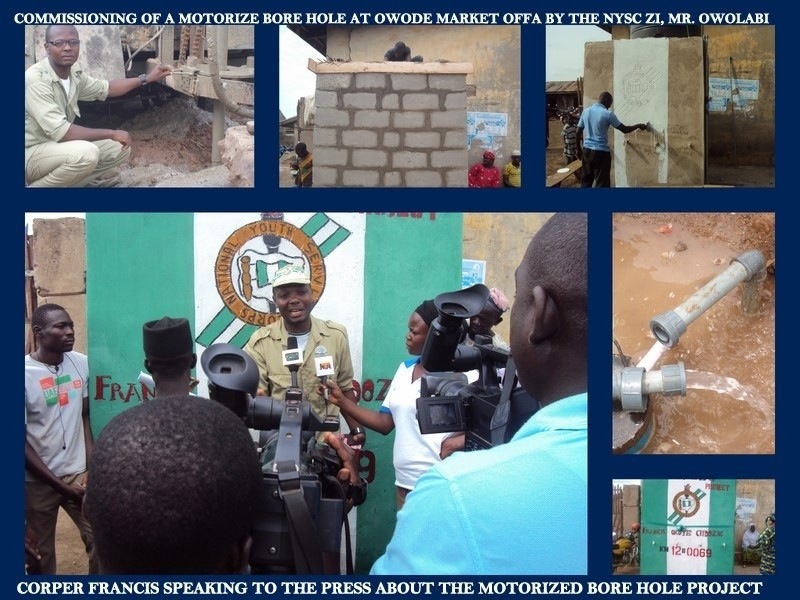 Construction of a Motorized Bore Hole at Owode market Offa. Renovation of NYSC Building (Secretariat) Offa Local Government. Construction of 20ft/6ft Directional Bill Board that bears “Welcome to Owode market Offa”. Construction of Executive Peacock Bird (Okin bird) at Owode market Police Traffic Junction. Donation of 2000 writing materials to six selected primary schools in Offa Local Government. Donation of one hundred Pairs of school sandals to five selected Primary schools in Offa. Donation of one hundred WAEC Recommended Novels (blind trust) and one hundred Pens to one hundred (100) SS1 students in Offa Grammar School (his PPA) that performed excellently (85 above) in the computer studies examination he taught in seven classes. Organized Quiz Competition Among all NYSC CDS Groups in Offa LGA at Okin Fm Radio Station Offa. Trained Less Privileged Mothers in Offa on Skills Acquisition, on how to Bake Cake, Chin-Chin, Donut, Fish Roll, Egg Roll, Meat Pea & Buns; and Empowered them with Coal Pot, Baking Flower and a Bottle of Vegetable Oil (One For Each Person). This gesture attracted an Award of Excellency and a Cash Reward of N50,000 to Corper Francis, From OFFA Local Government. Recommendation Letters from OFFA Descendant Union, His Royal Majesty, the Olofa of Offa, Owode Market Traders Association, OFFA Grammar School, Igbo Community Association Offa and OFFA Local Government Secretariat. Commendations, from Community Leaders, Government Agencies, Corporate Organizations around and Officials of the NYSC. Those present at the Commissioning were full of praises to the 25-Year-old Corper because he has demonstrated that even amid a generation that is selfish, greedy with common trait of a Me-First attitude, there are some individual who may not occupy any political or economic office but determined to make use of their personal resources to put smiles on the faces of people they encounter or even people in any environment they find themselves. Such may not be born with a silver spoon in their mouth, but an innate quality to impact positively on the lives of people coupled with determination and focus that drives them on. The communities that are benefiting from these projects should as matters of necessity encourage him with a Traditional Title that will encourage others to do same. Against this backdrop, the initiatives of Mr. Francis Okoye, With Registration Number KW/12B/0069 is worth considering. Single-handedly, he constructed a Motorized BoreHole, Renovated NYSC Building, Constructed a Directional Bill Board and Constructed an Executive Peacock Bird (Okin bird) at Owode market Traffic Junction, which is seen as the symbol and Pride of Offa Kingdom, etc. On the circumstance that prompted him to construct the Motorized BoreHole, he said: “Since the time immemorial, Owode Market traders have suffered serious pains because of Lack of water. The Borehole Constructed by the Federal and Local Government inside the market has stopped working for a very long time. He decided to Construct the Motorized BoreHole because he wanted to prevent market traders, women and children from drinking the available “Water from a Well” inside the Market, which poses a lot of health challenges due to impurity. Francis added: “I never believed I can achieve a Project as big as this, because I don’t have a Rich Father, Friends or Uncle who can support in issues of this magnitude. My Dad is a Retired Head-Master and my Mum, a Civil Servant at State Level. My NYSC Allowance is not even enough to pay my bills, and Meeting Sponsors in Offa has been a very difficult task. In-fact, it’s only God that has made this Project possible. On Renovation of NYSC Building, he said, “Home is a place of comfort and a place where strategic plans are made. As Corps Members, we can’t keep advocating for development and Change in our host community when our home is not in order. The building (NYSC Secretariat) is out of comfort. The Rooms, Zinc, Toilet, Doors and Windows needs total Rehabilitation and Renovation. My taking up this Project is to provide enabling environment for Corps Member and NYSC Officers in Offa to carry out their duties effectively. After the Renovation, I hoisted the Nigeria and NYSC flag and erected a Parade Basement. On Construction of a Bill Board, he said, “the need for Directional Bill Board to complement and promote the efficiency of this great market (Owode market) was also seen as another challenge by the market traders”. Embarking on this project was another beautiful thing that happened in my life, during my service year, and I will forever remain grateful to God, for this Privilege given to me through NYSC. On Peacock Construction, he said, “Culture, is people’s way of life. 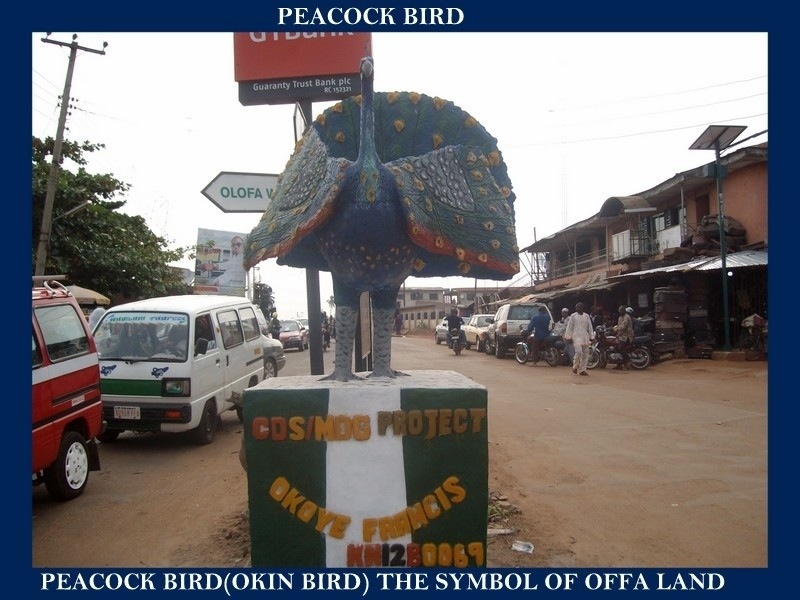 In Offa, the Peacock Bird is seen as the pride and symbol of Offa land, and as such, constructing this bird at a strategic point, will further promote its cultural essence in Offa. I took up this Project because I have come to believe in the culture and beauty of Offa Land. On Donation of 100 pieces of Treated Mosquito nets, he said: As the President of MDG CDS Group; This Project is in line with MDG Goal 6: “Combat HIV/AIDS, Malaria and other disease”. Having lived here for months, I realized that Mosquitoes breed heavily here, I was able to cope with the help of treated Mosquito Nets, I looked at those living in mud and thatched houses and wondered how they were coping. In that effect, I embarked on the search for treated mosquito nets which I distributed to One Hundred Households in GBOSUN/OGBONDOKO COMMUNITY, OFFA. More to this, due to his passion to help the Less Privileged Ones in the Community, he Donated 2000 writing materials to six selected Primary Schools in Offa, Donated one hundred Pairs of school sandals to five selected primary schools in Offa and Donated 100 WAEC Recommended Novels (blind trust) and 100 Pens to 100 SS1 students in OGS (His PPA) that Performed Excellently (85 above) in the computer studies examination he taught in seven classes. On these Projects he said, “This Projects is in line with MDG Goal 2, which target is to ensure that by 2015, children everywhere will be able to complete a full course of Primary Schooling everywhere. My aim of taking-up this Project is to Support and Encourage Less Privileged Primary school children in achieving Universal Primary Education. On how he Organized ‘On Air’ Quiz Competition for Corpers, Mr. Francis said “I embarked on this Project in collaboration with Offa Local Govt Inspector and Okin FM Radio Station OFFA, to Promote the Value and Objective of NYSC in Offa and Kwara State at large, by asking the contestants questions about NYSC Scheme. After the Competition, the winners where presented with an Award of honour. Mr. Francis also enumerated 100 families in Offa LGA, through MDG United Nations “My World Global Survey” and Trained Less Privileged Mothers in Offa on Skills Acquisition, on how to Bake Cake, Chin-Chin, Donut, Fish Roll, Egg Roll, Meat Pie & Buns; and Empowered them with Coal Pot, Baking Flower and a Bottle of Vegetable Oil. In his words, “this Projects is in line with MDG Goal 1, which target is to Halve between 1990 and 2015 the proportion of people who suffer from hunger and Poverty” My aim of taking up this project is to train and Empower Less Privileged Mothers On skills Acquisition. By the Special Grace of God the aim of this Project was actualized and the mothers are now in the field exhibiting the skills they acquired from the training and with the help of my little empowerment, they where able to start up a small scale business. This noble idea of a selfless youth should be encouraged with not just Verbal Commendations but with State, National and International Awards. The time, money and energy this Second Class Upper Degree (Elect Elect Eng.) holder from Anambra State University Uli could have been channelled into personal programs or that which will benefit his nuclear and extended families or even better him a lot in life but for his humane nature, decided to develop a community where he spent just 11 to 12 months. The communities that are benefiting from these projects should as a matter of necessity encourage him with a traditional title that will encourage others to do same. He spoke with the Press and promised never to give up in rendering social services to people wherever he goes, not minding the inherent challenges. He advised other youths to be selfless and always contribute their quota to the development of their communities and the nation alike. He appreciated his Sponsors, Contributors and Advisers. He also appreciated the people that guided and directed him all through his stay in Kwara State. In his words, “They made me feel at home even when am not home”. He is so grateful to the Management and Staff of NYSC Secretariat Ilorin. Finally, he remained indebted to his parents Chief and Mrs. Christopher Okoye, His Siblings Ebele Okoye, Nkeiruka Okoye, Somtochukwu Okoye and Ogechukwu Okoye for their endless Love, Prayers and Encouragement.